This small bookmarklet will allow anyone to use the "vulnerability" of the API that it allows you to check the up/down vote count - a feat you could normally achieve by being a 1k+rep user. 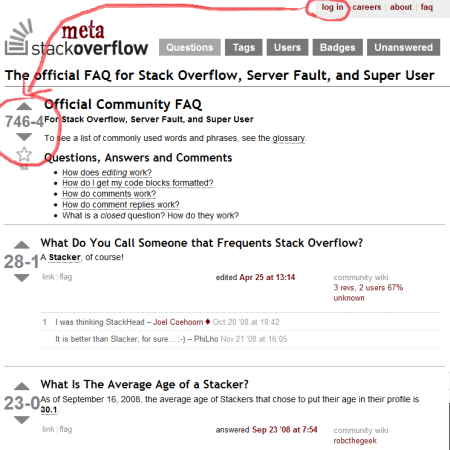 Mainly useful for sites where you don't have this amount of reputation points, but want to check the stats of the more controversial questions (usually on Meta Stack Overflow). No API key is actually used here, but it's trivial to add one. I don't think a code like this deserves anything other than WTFPL. EDIT: This is longer, but it will make the result look exactly like on Stack Overflow. 589 characters, so it might not work with Internet Explorer (that has a limit of 508 chars). For any jQuery/bookmarklets compatible browser. Tested with Chrome, Firefox 3.6 and Internet Explorer 8 for Super User, Stack Overflow, and Meta Stack Overflow. It was written in Notepad already in minified form, and I used Firebug to debug. (API 2.1 version was tested in Chrome's console) Code is above. Contribute (=decrease code size or make the output nicer) any way you want. EDIT: updated to API version 2.1. Very cool stuff! I'm going to be using it personally. Thanks for the hack! As this uses jQuery anyway, once the function is executed, the up/down vote counts are loaded into the background and click handlers are added to the total vote counts, so that it really resembles the experience that 1000+ rep users have. As it's under WTFPL, I'll try to implement those features myself and post my results. // @description    Uses API functions to display up and down vote tallies for questions and answers even when users have less than 1000 reputation. Updated the above codes to support API version 2.1. It does use some of the features of the new API (like the filters function, to decrease load on the servers). You can get the older, shorter API 1.0 version by checking the old revision. The upgrade made the codes longer, but the first one is still within IE's 508 char security limit. Also added a new script that will let you quickly check the up/down vote counts on the frontpage and similar (Hot, Featured, etc.) pages, to quickly check which posts are "controversial".